Onondaga Lake has undergone a massive remediation effort, involving the removal of 2.2 million cubic yards of contaminated sediment. The contaminated mud was dewatered in geotextile tubes, over a three year period, from 2012 – 2014. 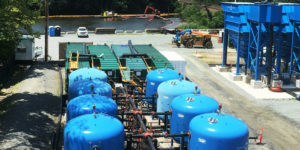 IAI was responsible for operations and maintenance management of the sediment dewatering system, including screening, gravity thickening, polymer injection, geotextile tube dewatering, and water treatment plant influent flow control. Large circumference geotextile tubes were stacked in six layers over the 50-acre Sediment Consolidation Area or SCA. 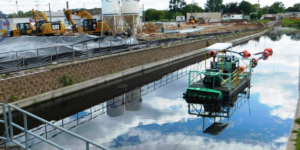 Dredge flow of up to 6,200 gpm (up to 40% solids), plus 600 – 1000 gpm sludge flow from the water treatment plant, was received and processed by the sediment dewatering system. IAI provided a staff of 25 personnel (on average) to manage, operate and maintain the system, and also provided consultation services during the design and operations phases of the project, including making recommendations for the ultimate configuration and equipment sourcing for the thickening, polymer addition and geotextile tube layout and header systems. 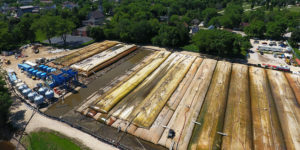 Meet up with IAI’s Dredging & Dewatering team at the World of Coal Ash conference in St. Louis, MO, May 13 – 16, 2019. You will find us in Booth #73 of the exhibit hall. Join us April 2 – 3 at DeVos Place in Grand Rapids, for the 2019 Michigan Townships Association Expo! Find us in Booth #217. The 2019 WEDA Midwest Chapter Meeting will be held March 6 – 8, in Memphis, Tennessee. Technical presentations, a Dredging 101 short course, and a tour are part of the agenda for this event. Our Dredging & Sediment Dewatering staff look forward to connecting with other contractors, regulators and stakeholders in Memphis. Join us!